Who knew 12th-century assassin's acted and moved like modern-day super spies? Assassin's Creed from Gameloft follows the exploits of Altair, a 12th-century uber-assassin out to dispatch nine of the individuals responsible for perpetuating the crusades. Like its Xbox 360 & PS3 big brother, AC on mobile places its emphasis on three major gameplay tenants: fast & fluid movement, robust hand-to-hand combat, and stealth. Unlike the console release, unfortunately, this mobile iteration relies largely on rehashing previous ideas to accomplish its goals, instead of actually trying anything new. Assassin's Creed feels a heckuva lot like Gameloft's numerous Prince of Persia and Splinter Cell titles. This engine re-use sticks out like a sore thumb if you're a mobile game junkie. But it is less of an issue if you haven't played through much of Gameloft's library. For an AC fan looking to extend their enjoyment of the game's universe, or just 2D game fans in general, Assassin's Creed has a lot to enjoy. The platforming action itself, which makes up the bulk of the game, can be extremely impressive when pulled off properly. Altair is animated lavishly, and it's not uncommon to pull off a string of maneuvers such as long-jumping into a series of wall-kicks, landing on a flagpole, then leaping onto a horizontal pole, gaining momentum with it, until finally jumping and landing on high ground. It's impressive and satisfying to pull all this off with one thumb on a tiny handset. The problem is that even gamers with superlative skills will only be able to successfully execute the above example about 50% of the time, thanks to control complications. To pull off a longjump into a wallkick, into a vine swing, and finally landing, you'd need to double-tap 6 to sprint, tap 2 repeatedly to jump, tap 4 and 6 alternately to gain momentum on the vine, and finally 2 to jump again. It's clunky, and I never fully adjusted. My hunch is that Gameloft recognized gamers would be dying over and over (and over), which is why checkpoints are generously spaced about 8 seconds apart. The game's other big failing is in its attempt to add weapon variety. Altair starts off with just a sword. He can of course attack, but also block, dodge, and parry. 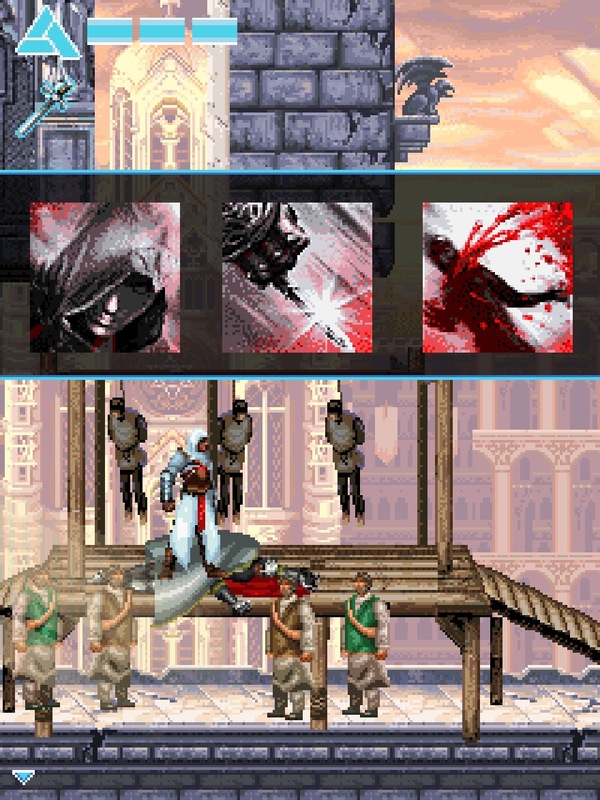 Sword combat can devolve into button-mashing, but overall it's a robust and rewarding combat system compared to AC's mobile peers. The same can't be said about the game's other two weapons - bombs, and a crossbow. The crossbow is the biggest offender: Stop. Pull up a menu. Switch to crossbow. Use 2 and 6 to aim crossbow. Hit 5 to fire. Pull menu back up. Switch back to sword. I mean... it's not exactly awful, but it becomes maddening after experiencing such fluid and responsive platforming and swordfighting. Why couldn't firing the crossbow be optionally assigned to a hotkey? There are a few major things Assassin's Creed gets right - level design chief among them. I felt like all of the game's nine-or-so levels struck a perfect balance between platforming, combat, and stealth. Additionally, new mechanics and gameplay wrinkles are doled out at a steady pace to keep things from feeling too repetitive. Ultimately, my biggest complaint about Assassin's Creed is that it feels like Prince of Persia, which feels like Rayman, which feels like Spinter Cell, etc. 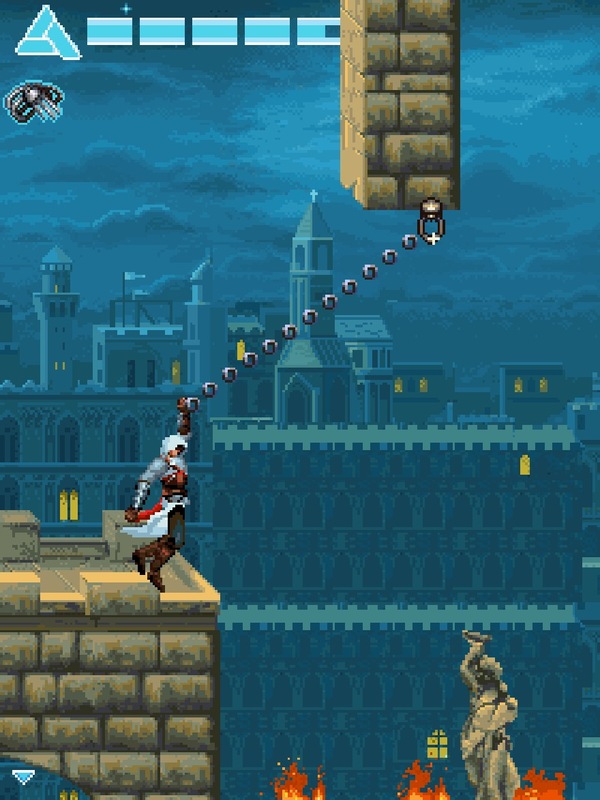 A gamer that didn't play all those titles would most likely love this mobile platformer, despite its complex controls.